Large five bedroom home on Little Spider Lake just 4 miles north of Minocqua Wisconsin on Little Spider Lake in the Northern Highland State Forest. Crystal clear sand beach awaits you with sandy, shallow water by the dock for children to enjoy. We are also just off the Vilas County snowmobile trail system as well. You can actually sled through the property to the trails! Main level offers laundry- mud room/bathroom, large bedroom with 2 single beds and a twin bunk bed which is a perfect bedroom for the kids. It also has its own 32' flat screen TV with satellite and Blue Ray DVD player. Fully furnished kitchen including some spices with island which opens up to a dining and great room with 20' floor to ceiling brick (gas) fire place. Lower level has two large bedrooms both with a king beds and an eight-person Finnish sauna, along with a full bathroom with jetted Jacuzzi tub and shower. All of the lower level has been remodeled recently. We also have recently added central AC to the entire home for your comfort. Sit back and relax on the upstairs deck or have a smores by your own private fire ring by the lake. Large outdoor wrap around deck with dual charcoal grills - Two metal tables with umbrellas and 4 chairs each. Deck has gated entry doors for small children and pets to roam in a nice secure area. Enjoy your own private dock and fire pit right next to the lake on your sand beach. Two 15' row boats, canoe, life jackets and a paddle boat are also provided. The swim area is ideal for small children- with a nice sand base past the dock. There is also a swim raft located in 6'-8' of water close to the dock. Little Spider Lake is a 265 acre lake that is home to Musky, large mouth bass, northern pike, perch, walleye, crappie and other pan fish. Other wildlife include Bald Eagle, Blue Heron, Mallard ducks, Loons, fox, deer, but seldom seen bears or wolves..
Pictured above is a group enjoying the large dining room table in the great room. We try to make this your home away from home. In 2009 Ken and Linda acquired her father's (Jim) home and decided to add this spectacular home to its rental business--Lake Rest Cabins. With each unit having a totally different decor, it made sense to make this available to those who needed more space and wanted more amenities. Jim built this home as his primary residence with his wife Fran in 1982. The magnificent fire place that is the centerpiece of the great room includes bricks from the former Minocqua Community Building which burned down in the 1970's. As you walk the grounds of the current remaining 10 acres, note the tall pines that were not taken during the logging days of the early 20th century. We work to keep the solitude that is craved at its best while trying to add enough comforts to give every family a memory to be cherished. Many extra amenities such as coffee, coffee filters, hand soap, bath soap, dish and dishwasher soap, laundry detergent, shampoo, toilet paper, paper towels, kleenex, garbage bags. 3 very clean bathroooms with hand rails by each shower. We are able to use our cellphones and get reception from this home. The trees do limit areas where you can utilize them. Blue Ray DVD player in Great Room and standard DVD Machine in kids room. Beautiful home in the north woods. Well appointed with everything you need. Lots of kitchen gear so cooking was a breeze. New appliances too. Beds were very comfortable. Kids loved the bear and moose bedroom. 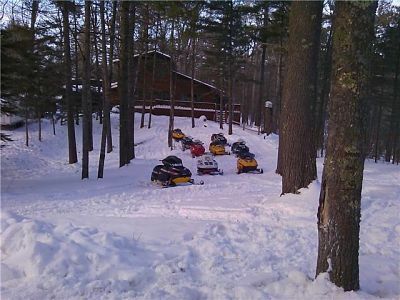 Very close to great snowmobile trails and close to town too. We wouldn’t hesitate to stay again. Made lots of good memories! Thank you!! Had a great time. Booked next year already. Some peeps went ice fishing, some peeps stayed back and played cards or games and maybe drank a little. Thanks for letting us come. We came up for a few days of riding and this place was perfect. Very easy access to a main trail(that branches off to many other trails quickly) and only a few miles to the gas station/bar/grill. Owners are great people and very helpful with whatever we needed. Would very much recommend! Stayed here during a snowmobile trip. There was 8 of us. Owners were great, the place was very spacious for our group. Would stay again. Don't have to bring anything except your clothes & personal hygiene items. Fully furnished, spacious, serene setting, easy access to everything. Private lake & close to snowmobile trails, quiet area & the owners live next door & are super accommodating . This is our 3rd time staying here. Excellent Property with an Excellent Owner. Highly recommended if looking in this area. The property is in the perfect location, right on the lake with only a 10 minute drive to town. I went there on an annual snowmobile trip and the cabin was located not 5 minutes from the DNR trails. All the accommodations were perfect and the house had everything we needed including the things you don't always think about when traveling and renting a house. Nothing was left out. The beds were also very comfortable which I find important when traveling. The owner is also located right next store and introduced himself upon arrival. Lake Rest Cabins is a 10 acre resort complex located just off of Highway 51 North (1/4 mile) on 8+ acres of wooded land. Lake Rest is in the Northern Highland State Forest in northern Wisconsin. LRC is about 50 miles south of the Upper Penninsula border of Michigan as well as less than 45 minutes from several waterfalls. This home rents from Sunday to Sunday in the summer season with full week rentals required from June throughthre end of August. There is an additional pet fee should you wish to bring your pet including vaccination informaion. NOTE: ANY ITEMS THAT NEED TO BE RETURNED WILL BE RETURNED AT A MINIMUM COST TO THE RENTER OF $25. 3-night minimun stay.